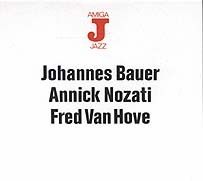 Johannes Bauer, trombone; Annick Nozati, voice; Fred Van Hove, piano, accordion. Recorded on 6 September 1988 in Berlin. Go to Independent Recording Labels Page.